“During my senior year at Ramapo College of New Jersey, I had the opportunity to intern at Ruotolo Associates Inc. (RA), a company started by George C. Ruotolo, Jr. in 1979 to provide fundraising and public relations counsel to nonprofit institutions and organizations. George Ruotolo is the Immediate Past Chair of Ramapo’s Board of Trustees and I had the privilege of working under his leadership. Upon graduation in May, I was offered a position as a full-time associate with the firm – I am the first RA intern that has transitioned to full-time. My education at Ramapo College prepared me well and I am excited about my future.” – Rebecca Scairpon ’18 graduated with a degree in Business Administration. 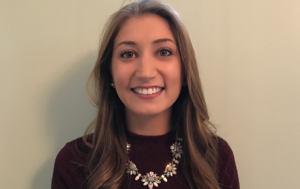 While at Ramapo, Rebecca was a Resident Assistant in the Village and a Peer Facilitator for first-year students. She also worked at the Center for Student Success as a Connect Student Data Analyst and served in the position for three years. She was a member of Rho Alpha Sigma, where she served as Treasurer, and a member of Omicron Delta Kappa Honor Society. Rebecca also was a member of SGA’s sustainability committee and volunteer member on Ramapo College’s Academic Integrity Board. She received the following awards: 2018 Jerome Lee Memorial Award for Outstanding Leadership, Resident Assistant of the Year for the Village 2016-2017 & 2017-2018, Student Employee of the year 2017-2018.